Prices range from $12 - $1,575 per clothing item. Returns or exchanges accepted within 90 days of purchase date. Brooks Brothers is the oldest clothing store in the United States. It was started in New York in 1818 which makes it almost 200 years old. They were the first clothier to pioneer ready-made suits in 1850, when back then all new suits were custom made by a tailor and needed to be ordered weeks in advance. Since then the company has offered many firsts to their customers and has grown to offer all types of apparel and shoes for men, women, and youth. Brooks Brothers is a high end clothier and has the prestige of outfitting 39 of the 44 American Presidents plus many stars of Hollywood. Currently you can buy Brooks Brothers clothes and shoes online or at one of their 210 stores across the United States, and 70 stores found in over 20 other countries. 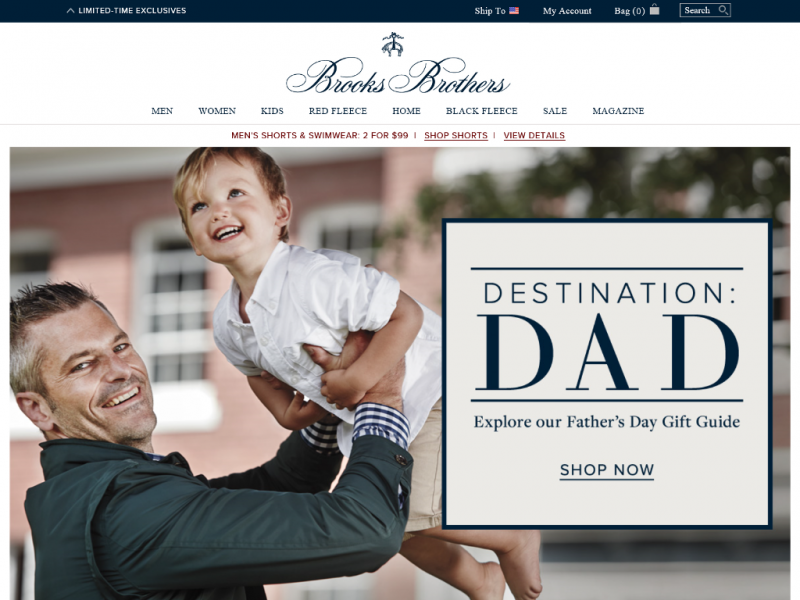 The Brooks Brothers website supports desktop computers and mobile devices and is setup similar to other clothing retailers. The top menu is divided by men, women, and kids along with a sale and magazine category. The menu is then further divided into sections which promotes featured products, apparel, and shoes & accessories for each of the genders. 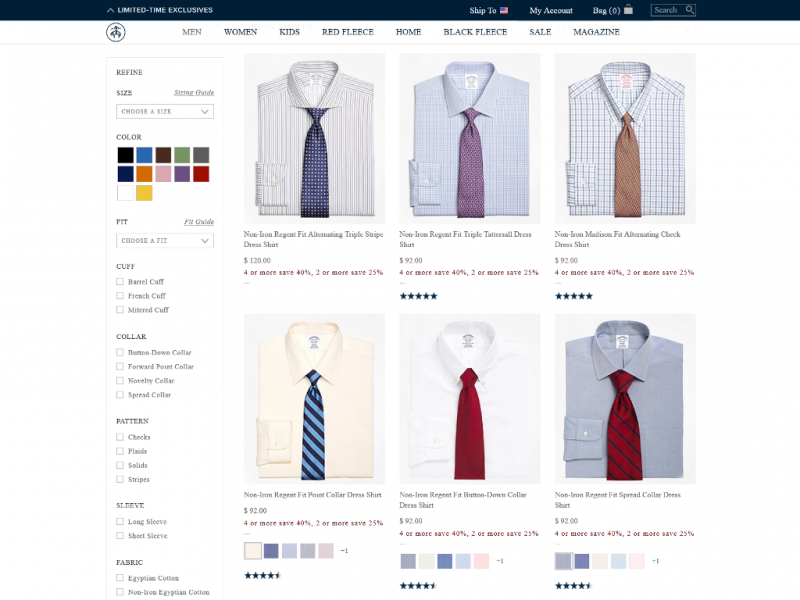 Featured products includes what Brooks Brothers is best know for. This includes dress and sport shirts, ties, Polos & sweaters, and casual pants & shorts. We also can't forget the Brooks Brothers made to order custom shirts & suits. Selecting a clothing, shoe or accessory category from one of the sections will bring you to the categories gallery page. From here you can page through a list of products. For each product the name, an image, price, and any savings discount will be listed. If the apparel comes in different colors you can also select from these to change the gallery image of the product to that particular color. If an average customer rating exists for that product it will be displayed as well. In the left hand column of the gallery you will be able to refine what products are displayed in the category with a number of different filters. You can specify what sizes, colors, fit, and other related attributes of the product category you are viewing (i.e. for shirts you can specify collar or pattern). Once you have found a product you like, just click on the gallery image to view the product detail page. Here you will find larger images of the product which you can mouse over to see a magnified view. A description is also given which highlights the features of the garment. If it is something you like, you can then add it to your shopping bag (your cart) by selecting the color, size, and fit (if applicable) along with the quantity you wish to purchase. If you are logged into your Brooks Brothers account you may also add the product to your wishlist. Brook Brothers sizing charts are accessible from every product page just in case you want to review any measurements to determine what size you need. On the product page you can also view any reviews posted or add your own review of the product. On your review you can give a title, description, along with rating the fit, quality, and appearance of the clothing or shoe. Apparel available at Brooks Brothers for men and boys includes formal wear (tuxedo, suits, ties, dress shirts, etc. ), casual wear (sport shirts, shorts, pants sweaters, etc. ), outerwear, under garments, sleepwear, and swimwear. Women and girls can also find dresses and skirts. Brooks Brothers offer men the option to custom design their own dress shirts and suits. For each you first start with selecting the fit (Milano, Regent, Madison, Fitzgerald, and Traditional). Once you select the fit you then are redirected to the design page. 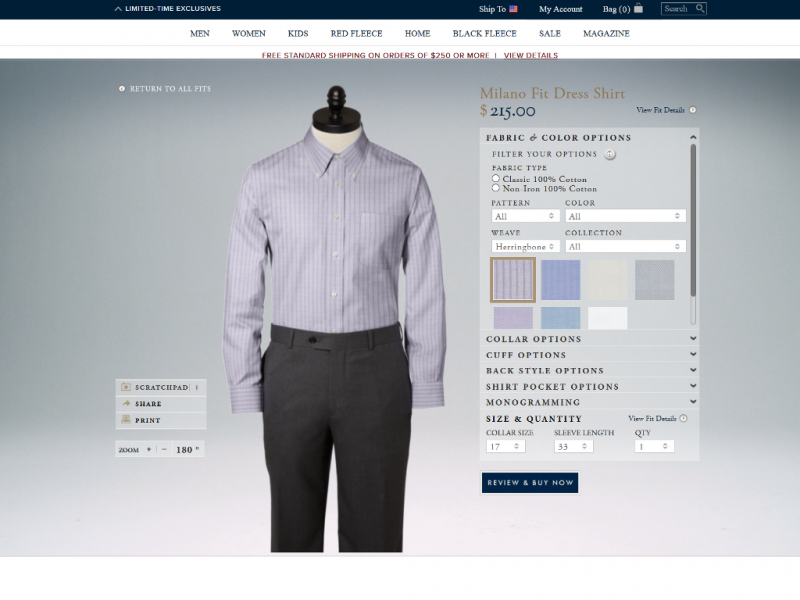 On the left side of the page is an image of the suit you are customizing. On the right side of the page are the avilable options. Every time you update the style, color, and other attributes of the suit or shirt the image will change to reflect your selection. With custom shirts you can specify the size (collar and sleeve), fabric type, pattern, color and weave. There are also options for the collar, cuff, back style, pockets, and monogramming. With custom suits you can pick jacket style and size, fabric and color, lapel edge, vent, pockets, jacket lining, and trouser style and size. Design your own shirts and suits requires 4 to 5 weeks to craft plus shipping time. Custom suits cost around $650 depending on fabric and features chosen. Custom shirts range in price of $160 to $270. Brooks Brothers sells casual, dress, and formal shoes for men, women and kids (less options for women and children). Styles available include sneaker, athletic, slippers, sandals, monk strap, loafers, moccasins, boots, boat shoes, and galoshes. The shoes are designed in a wide range of materials including leather, cotton, rubber, and wool. Standard shipping is free on orders over $250 if shipped within the 48 contiguous United States. Shipped products can be tracked online at BrooksBrothers.com. Standard delivery takes between 3 and 7 business days. 2 business day and next business day shipping is available for an additional cost. Brooks Brothers clothing and shoes range in price from $12.50 for a pair of socks to $1,575 for a Madison Fit Tuxedo. * All prices are in USD unless specified other wise. Prices, coupon codes, products offered, and product features last checked June 09, 2016. Brooks Brothers will accept an exchange or return of a purchased product if in original condition and within 90 days of the purchased date. The original receipt is required. Items can be returned at a Brooks Brothers retail store or by using the SmartLabel from the packing slip if the product being return was delivered to you. Customer service for Brooks Brothers is available 7 days a week (7am to Midnight EST) by calling a toll free phone number. You may also reach out by email or online submission form. Questions about merchandise can also be answered by one of their sales persons by visiting 1 of the over 200 stores found in the United States and Canada. 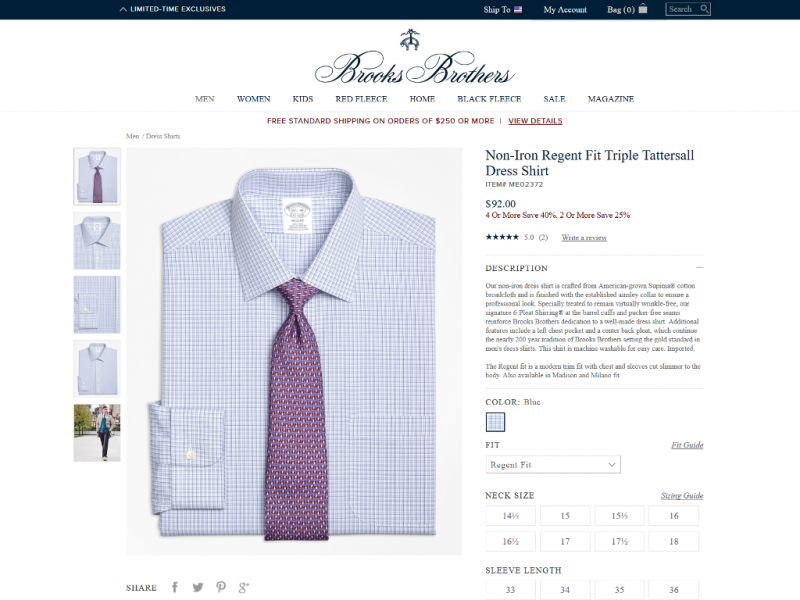 Brooks Brothers also offers an email newsletter and a number of different catalogues you can purchase clothing from. Social media is a big part of Brooks Brothers business which is why they have active pages on Facebook, Twitter, YouTube, Instagram and others. I shop online and also at the Brooks Brothers Outlet located near me. You can find the 346 brand in the BB outlet stores mainly. I usually purchase the 346 polos because I like the look and feel of the material and weave. I also wear the Brooks Brothers dress shirts during the week for work. Very comfortable. I recommend getting a few non-iron cotton for dress shirts. They are very wrinkle resistant and great if you have not done the ironing in a while. Prices can be expensive but their quality is very high. If you shop smart at their outlet stores and on sales on their website you can find plenty of good clothes for great prices.